On Tuesday the 8th of August 2016, Lisa and myself started a new business venture, L & R’s Wellbeing and Weight Loss Programme. An eating programme that is : achievable, managerable and realistic in today’s modern life, but also didn’t leave you feeling hungry and punished. A programme that is healthy and healed the body from the inside out. Made the person feel healthier and fitter, a better looking skin tone and generally looking and feeling alive. The programme had to have a (optional) built in beneficial and achievable exercise plan with variations for all levels. Nutritional with “no” added preservatives, colourings or stabilisers. And to quote Jason Vale; have a Low H.I. (Human Interference). Exit strategy: This is to Educate and guide the client onto a healthy lifestyle plan that can be independently achieved and easily maintained. As a trial / pilot we selected a volunteer / Guinea pig (Pam). She was weighed had her BMI taken, Body Fat % and water content % measured. She also had all her body measurements from head to toe taken. The results are now in from the first 5 days of the trial and we believe they are outstanding and impressive. In 5 days all the above goals have been achieved (what a blessing and answered prayers). Pam lost 9lb 4o/z in 5 days! Waist: One and a half inches. Thigh: One and a half inches. Plus a small loss on the other measurements . Fantastic results in such a short time !! Hi its Pam, the guinepig for L & R weight loss program. 15 years of being over weight i have finally found something that works and changes my addiction to food . Also I recomend anyone suffering with there mood or feeling down or even depressed etc to try it , I have never felt so clear headed I can’t explain it, yes you will still have bad days but I feel my mind sets changed and eating clean and exercising really does make the world of difference what have you got to lose by trying ? just 10 day juicing and the results are crazy and so quick i have never felt better, not just physically but mentally, also changed the way i think about food like no other diet or healthy eating plan has before.. on this plan it’s diffrent for me it changed my relationship I feel so good after juicing and eating clean that I don’t want to go back .. I feel juicing is the key to changing your whole way of eating i feel thats why none of the other weightloss programs work in the long run for me any way , as its not detoxing your body of all the years of bad eating your trying to fix a problem while still leaving it damaged.. remember this is more of a detox your not going to never eat breakfast or lunch again but it repairs your body ready for the new healthy you, and this plan does just that with out feeling to hard or hungry , i feel so more energised and alive ! A short summary on how it works. Lisa and Richard have been involved with healthy living through good nutritious food and exercise for some years. In recent years juicing and smoothies have played a large part in their daily life making a huge difference to their weight, health, overall body tone and general wellbeing. They have now taken the next step and that is to share it with others and help them to understand why good nutrition can make such a vast difference in their daily lives. 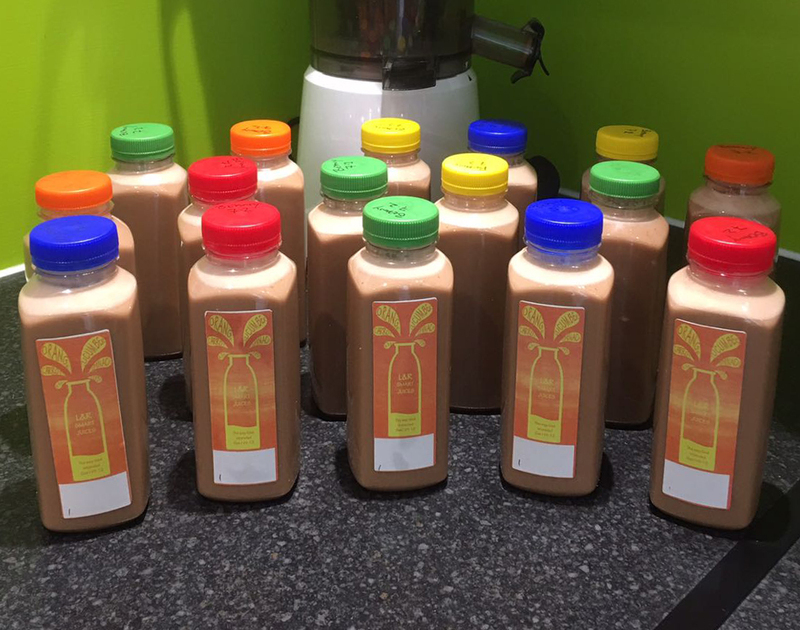 The programme lasts for 12 days and consists of 5 days on the L&R programme – 2 days off the L&R programme – 5 days back on the L&R programme and includes Nutritional shots and Juices made by L&R. Two consultations are conducted one at start and another one on completion, this is where we give you the full detailed run down on how the L&R programme works, record all your vital statistics including your BMI, Body Fat%, Body Water %. Supply you with educational and motivational advice and a daily moderate exercise plan which can be adapted for you personally. (Evening meal to be supplied and prepared by yourself with recipe guidance from L&R). The cost of this programme is competitively priced at the great value of £75 per week. 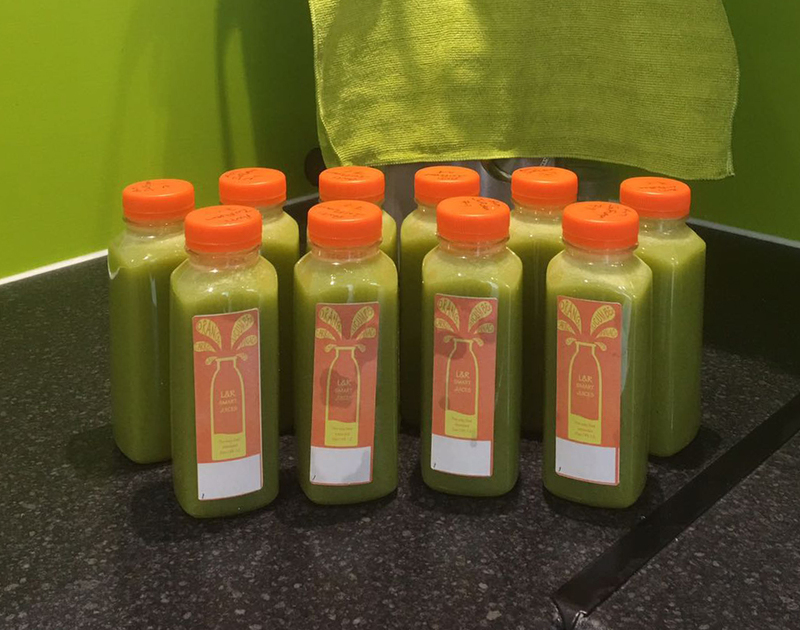 Juices will be delivered for people living locally (can be picked up if more convenient). Some juices may have to be frozen depending on what day delivery is made. Please be aware that we are not Doctors, so it is important BEFORE making any changes that you consult with your GP or Medical Practitioner. The suggestions above are not meant as an alternative to any current medical treatment so please DO NOT stop taking any medications you are on. They are also not an endorsement of their effectiveness, nor a recommendation that they should be followed but instead, provided for informational purposes. None of the information on the Natural Juice Therapy site is intended or implied to treat, cure or prevent any condition or disease.